SUFFOLK, VA (May 20, 2018) — In reality, Dudley Payne III wasn’t even supposed to be here on Sunday, at least not playing with Francesco Romano in the 53rd Virginia State Golf Association Four-Ball Stroke Play Championship at Cedar Point Country Club. Romano’s usual four-ball partner, Chris Laughlin, was unable to play this weekend due to a prior commitment. So just before qualifying began, Romano called Payne to gauge his interest in playing the event, and a partnership was formed. 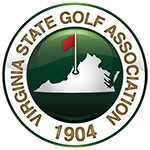 Payne (Fauquier Springs GC) made a crucial eagle to cap a torrid back nine-stretch, and Romano (Raspberry Falls G&HC) clinched the side’s victory by sinking a 10-foot par putt on the first playoff hole. After posting an 11-under 133 over 36 holes, the par on the 37th was enough to claim the win. The victory was the first for either player in a VSGA championship. Payne and Romano had to fend off Jimmy Delp (Laurel Hill GC)/Ben Keefer (Hermitage CC) and Buck Brittain (The Virginian GC)/Garland Green (Tazewell County CC) in the playoff on No. 18, a monster of a 482-yard par 4 that yielded little in the way of birdies this weekend. Delp and Keefer, one of two sides tied for the 18-hole lead after posting 64 on Saturday, made a charge at the end and had a chance to win the championship outright. Delp drained an eagle putt from the back of the green on 17, letting out a huge yell and a fist pump as his side moved to 12 under with one hole to play. But 18 played difficult as usual, and neither player hit the green in regulation. Delp’s long par putt from off the green just missed, sending the event into a playoff. Brittain and Green made it to the playoff thanks to Brittain’s brilliant up-and-down from the right-front bunker on 18, one that included a lengthy putt for par. In the playoff, all six players teed off on 18 in the same group. After the first five players had hit and all five had missed the green, Romano bounded back across the fairway to his cart to grab a different club, his strategy altered. On Saturday, both players laid up short of the green, then got up and down for par. Romano laid up to a preferred number, then hit a wedge up to leave himself 10 feet for par. When he sank the putt, he pumped his fist and found Payne to celebrate. None of the other four players had an easy look at par in the playoff, and the other two sides settled for bogey. The championship was decided by a playoff for the third straight year and the fourth time in five years. Payne and Romano needed a surge on the inward nine just to get into the playoff. They turned at even par on Sunday before making three birdies and an eagle on the back. Trey Smith (Windy Hill Sports Complex) and Chase Duffy (Red Wing Lake GC) finished alone in fourth after returning a second straight 67 for a 10-under 134. Smith barely missed a birdie putt on 18 that would have put them in the playoff. Levi Washburn and John Damond (Heron Ridge GC) posted a second straight 68 and tied for fifth at 8-under 136. Chase Bailey (Blue Hills GC) and Lee Fisher (Poplar Grove GC) struggled on Sunday after sharing the 18-hole lead with a Saturday 64. They shot an even-par 72 to tie for fifth, their only birdie coming on No. 17. 36-hole four-ball stroke play competition (18 holes per day). Open to golfers of all ages. Participants must hold an active GHIN number issued by a licensed VSGA Member Club in good standing.